Cheesecake is a simple dessert to whip up. You just dump and stir all the ingredients. The trick is in the baking. Avoiding that dreaded crack or sinking hole in the middle is tough. I flavored my cheesecake with orange and ginger. On a recent shopping trip, I found a store in Ottawa (Grace in the Kitchen) that carries spices from Montreal's Philippe de Vienne’s line of épices de cru (small-production "estate" spices). I was lingering over all the tins of spices displayed on their shelves, trying to find cinnamon. When I asked about the spices, the seller excitedly started telling me about Philippe de Vienne and his wife Ethné who travel the world searching for the best spices to bring back and package for the rest of us. He opened several sample tins for me to sniff. It was a veritable scent spa. From Mexican oregano to dried lavender, de Vienne carries many common spices and several rare ones. It was hard to choose. Since ginger is one of my favorite spices, I picked up a tin hand-picked from China and found cannelle de Ceylan as well. On another trip to Grace in the Kitchen, I purchased de Vienne's Ras el Hanout, meaning "head of the shop" in Arabic, and refers to a mixture of the best spices a seller has to offer. You'll have to check back to see what I do with this exotic blend of spices. To see the different versions of cheesecakes cropping up all over the foodblogosphere, check out the Daring Bakers Blogroll. In a food processor, grind the graham crackers, almond meal, hazelnut meal and pistachios. 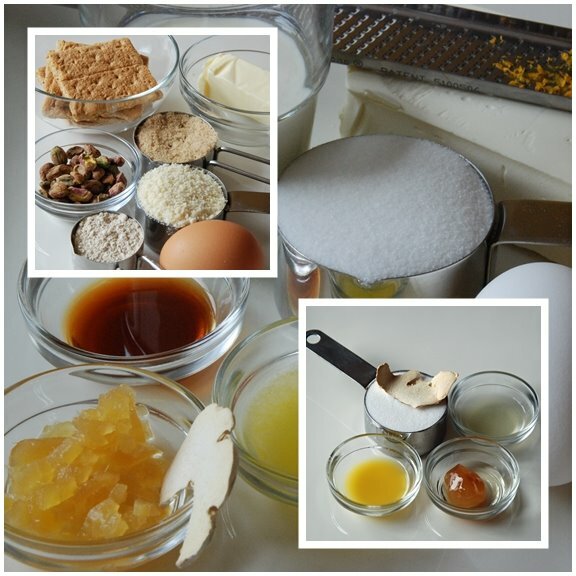 In the bowl of a stand mixer fitted with the paddle attachment, beat the butter and sugar until light and fluffy, about 3 to 5 minutes. Add the eggs one at a time until fully incorporated. Fold in the graham cracker mixture. Form the dough into a log and chill it in the refrigerator for up to 1 hour until it is firm. Preheat oven to 350°F (Gas Mark 4 = 180C = Moderate heat). Cut the dough into slices about ¼-inch thick. Place on a parchment-lined baking sheet, leaving about 1 inch between each cookie since they spread while baking. Bake for 10-12 minutes, or until crisp and golden. While they are still warm, use a cookie cutter to cut them to a specified size. Let cool. Preheat oven to 350°F (Gas Mark 4 = 180C = Moderate heat). Begin to boil a large pot of water for the water bath. Pour batter into prepared crust (if you're using a traditional graham cracker crust) and tap the pan on the counter a few times to bring all air bubbles to the surface. Place pan into a larger pan and pour boiling water into the larger pan until halfway up the side of the cheesecake pan. If cheesecake pan is not airtight, cover bottom securely with foil before adding water. Bake 45 to 55 minutes, until it is almost done. This can be hard to judge, but you're looking for the cake to hold together, but still have a lot of jiggle to it in the center. You don't want it to be completely firm at this stage. Close the oven door, turn the heat off, and let rest in the cooling oven for one hour. This lets the cake finish cooking and cool down gently enough so that it won't crack on the top. After one hour, remove cheesecake from oven and lift carefully out of water bath. Let it finish cooling on the counter, and then cover and put in the fridge to chill. Once fully chilled, it is ready to serve. Tip: Use a disposable foil pan that is 8 or 9 inches wide and really deep, and best of all, water-tight. When it comes time to serve, just cut the foil away. I used a mini cheesecake pan to make individual cheesecakes. I didn't use a water bath and baked them for 25 minutes. Then, I turned the oven off and let them cool for 45 minutes in the oven. No cracks, but I had some sinking problems. Combine the sugar, lemon and 2 tablespoons water. Cook over medium heat until the sugar caramelizes and the mixture turns an amber color. Carefully pour in the orange juice. Add the stem ginger and ground ginger. Add more orange juice, if needed, to thin the sauce. The strong, spicy ginger in the cheesecake and sauce was perfect with the homemade graham cracker cookies. 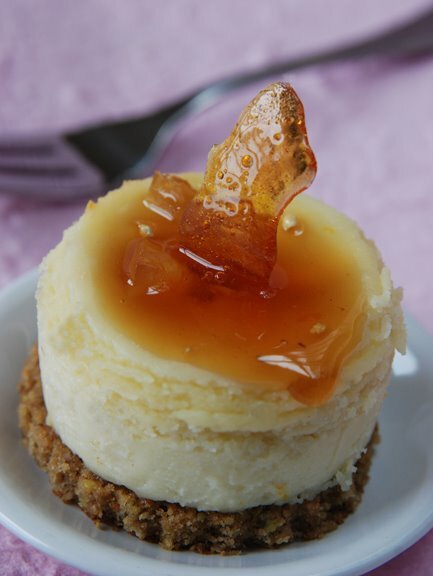 The hint of orange in both the sauce and the cheesecake cut the sweetness of the cheesecake. And the individual small cheesecakes were a perfect portion for this rich, decadent dessert. MMm, sounds delicious! I used orange too (I'm really starting to like orange in baked goods... I'm getting a little burned out on lemon). The spice shop sounds wonderful. Lucky you! oh yum this sounds gorgeous. lovely flavor combinations here shari! well done! Your cheesecake is perfect! The sauce on top is artistically appealing as well as tantalizing! And all the info on spices! I thoroughly enjoyed the interview with Phillipe de Vienne! I learned a lot! Thank you! Amazing post!! Your cheesecake looks delightful. And you are so right - it is easy enough to make. But it's the dreaded crack on top that drives me nuts. Shari - those are gorgeous! I liked this challenge - simple cheesecake was so fun to experiment with. You really did a gorgeous job. Orange and ginger, one of the most heavenly combinations! what a GREAT idea to literally spice up the typical gingerbread crust AND give it a unique presentation. i love the incorporation of the nuts! ...i can tell my father in law it's healthy! hey and thanks for visiting my blog! what a treat! What a fantastic idea! I absolutely love the look of this dessert... and the fact that it includes the flavors of orange/ginger together is just the icing on the cake! Oh, I'm loving the idea of a cheesecake sandwich like in the final picture- Yum! Beautiful, I love this version! Oh wow, this is gorgeous! I would almost hate to eat this and mess it all up. Very impressive. What a score! Great spices, I would love to check out his shop. I am a big fan of ginger, great flavour combo. I really like the idea of a graham cracker cookie crust. It's not much extra work, and it looks fantastic! Points for creativity. Orange and ginger sounds wonderful in this! 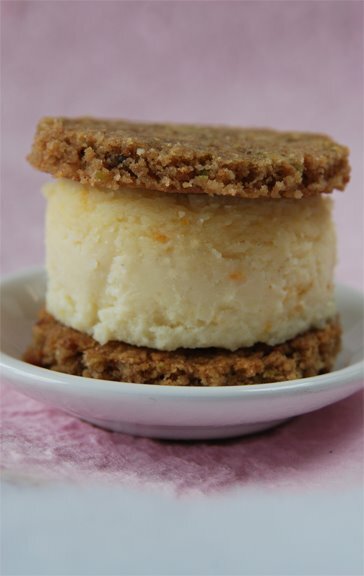 Ooh, I so want that cheesecake cookie sandwich-nom nom nom! YUM! Ginger and orange flavors sound delicious. Your cheesecake looks perfect. Great pics! You are just amazing. Simply amazing. This looks amazing. Your combination of orange and ginger is wonderful! I find it kinda funny that you used orange and ginger... when, today I'm posting my chocolat cream tart for the TWD... and I flavored it with orange and ginger. Beautiful cake and amazing pictures!! really, when it comes down to it, i enjoy the crust of a cheesecake most of all, particularly when it's made with graham crackers. i save it til last and then savor every morsel. great variation, shari! Nicely done making your own crust. I normally just beat graham crackers into submission. Also, you can never go wrong with ginger and orange. Just something about those flavors that is amazing. Heck I can eat ginger candy all day long. Oh my, Shari! This combo of flavors sounds incredible. It is now on my list! It'd drop-gorgeous. I love the flavours & the cookie crust! That box of spices is endlessly inriguing too Shari; love how you brought together the flavours mmmmmmmmm! Oh man, Shari, this cheesecake looks delicious. I'm loving the orange and ginger flavor combo. It's so refreshing. Ginger is sooo fabulous! Great job! Is that dried ginger in slices? 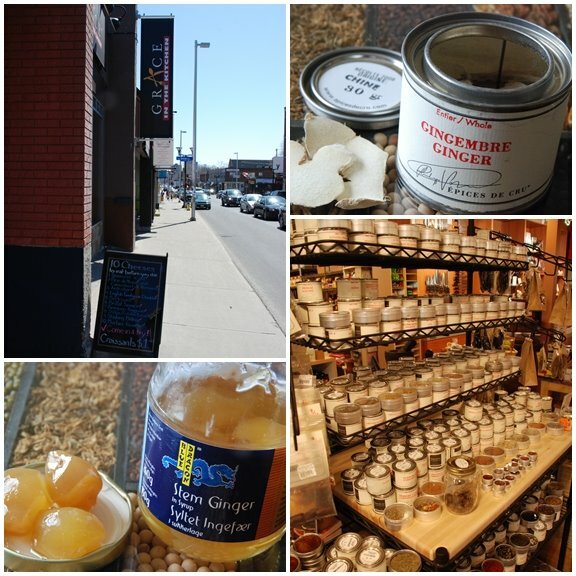 I've never seen ginger in that form before (or the stem ginger in the jar for that matter). I always either buy it fresh, or dried and ground. That store looks fun, where is it? And your cheesecake looks wonderful. Wow, sounds like a really cool store! And your little cheesecakes look delicious. I've never tried to make my own graham crackers--neat idea. Sooo beautiful!!! You are so lucky to have such a great store. Here in Podunk, USA, we just don't have them. I will live vicariously thru' YOUR store. WOWZERs, this is so beautiful. Nicely done and GREAT blog, love it. I love that you made your own graham crackers! I would spend so much money in that spice store. Thanks for being a part of this challenge. It is taking me a while to get to every post, so sorry for being delayed in commenting.